Steven Spielberg bumped the production schedule of a couple other projects in order to get this one shot and released within a year. He felt it was timely considering the assault on the free press in the country and the lawlessness of the Trump administration. The story centers on the Washington Post and the decision to publish the Pentagon Papers which were leaked by Daniel Ellsberg (played by Matthew Rhys) in which it was revealed that the government had been lying to the public for decades about the Vietnam War. The New York Times broke the story first but WAPO jumped onboard and after legal actions, threats from the Nixon Administration, the Supreme Court, ruled that the press answered to the public not the government. There is a subplot of equal footing in this script. That is where Katherine Graham (Meryl Streep) has just taken over the paper, is going public with a stock offering, but in an age where women are second-class citizens. Frankly, no one thinks she is up to the task. With the fortunes of her paper and family at stake, she has to step up to the challenge. Her personal struggle is a major emphasis of this movie. You really can't go wrong with a Spielberg directed project. 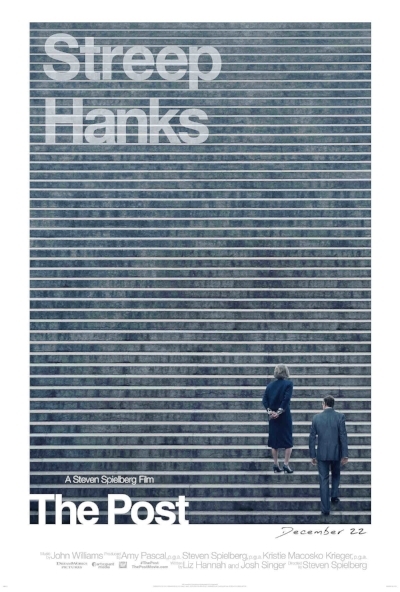 Tom Hanks is great as the legendary Ben Bradlee. But this movie is very much an ensemble type effort. One actor who stood out to me was Bob Odenkirk as reporter Ben Bagdikian. He did great in this supporting role. But the real stars are the writers, Liz Hannah and Josh Singer, because they weaved a complicated fabric into a tight story that keeps the audience engrossed until the very end. They are sure to be nominated for Oscars tomorrow as probably will be several others from this movie. This movie is a 5 by 5 effort and definitely worth the money at the box office. Kudos to Spielberg for reminding us how events of the past can still be timely.